The first orphan of 2016 rescued by Marsha Gaspari and returned to the nest site by Staff Vet Dave Scott. Photos by Marsha Gaspari. 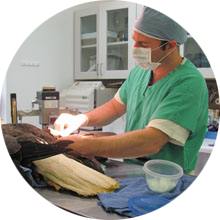 Between 800-1,000 injured or orphaned raptors are brought to Carolina Raptor Center's Jim Arthur Raptor Medical Center each year. Credit for this large number belongs to people in our community who care enough to take action when they see an injured bird. 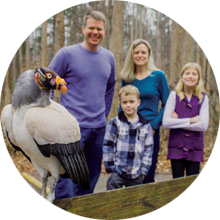 These concerned citizens bring many birds directly to Carolina Raptor Center, while others arrive in the capable hands of Carolina Raptor Center's transport volunteers. Some of our patients come from other wildlife rehabilitators, who may need a second opinion in a particular case or may not have large enough cages to provide exercise. Join our Raptor Transport Team and help us get injured and orphaned raptors from around the region to Carolina Raptor Center for treatment. More info. Find an injured raptor? More info. Find an injured songbird? More info. Find other injured wildlife? More info. Track your injured raptor on RaptorMed. More info. 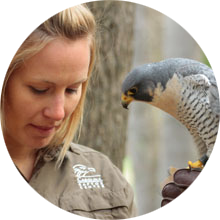 Get a glimpse of what's going on in our Raptor Medical Center now! Follow our Rehab Blog. 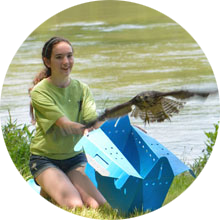 Apply for our RaptorVet externship for veterinary students. More info. Purchase Dr. Dave Scott's book - The Handbook of Raptor Rehabilitation. More info. Build a nestbox for your yard. More info. Learn about New Cameras in the Wendy Ella Guilford Owl Observatory. Coming Soon.